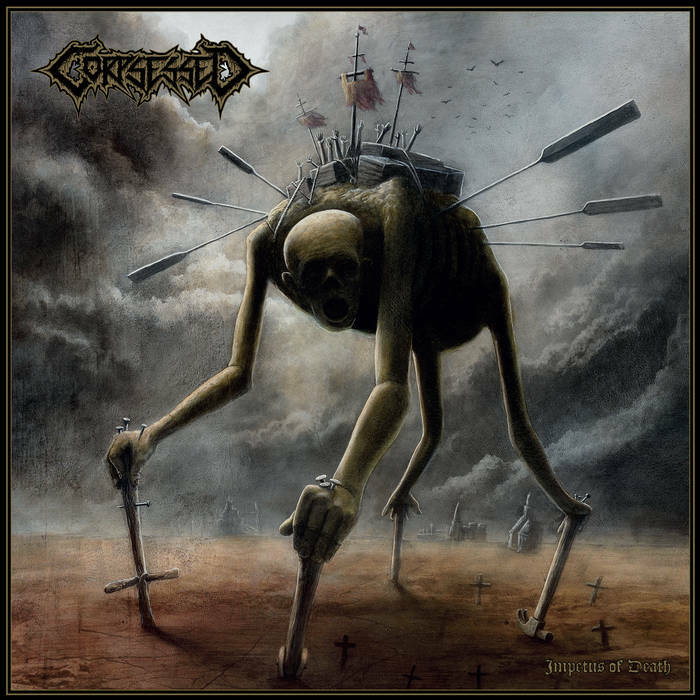 This is the second album from Corpsessed, a Finnish death metal band. 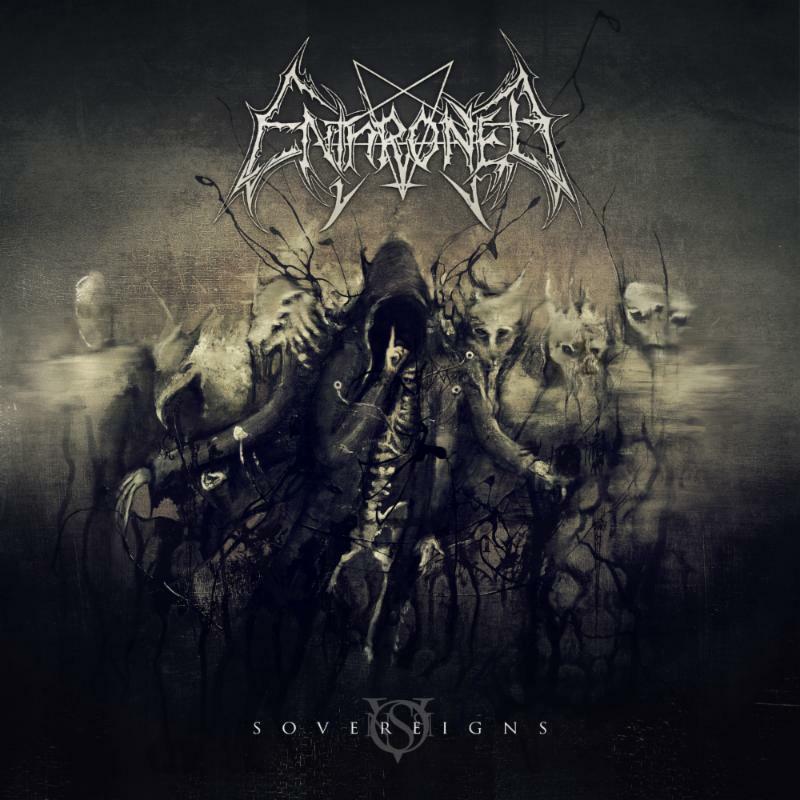 Enthroned are a veteran Belgian Black Metal band that need little introduction; this is their 10th album. It opens with a massive ominous intro. Normally I’m against pointless intros as they usually serve little purpose, but this one is compelling and the horns sound immense; it sets the scene well for the approaching carnage. It takes time to build up to a fast tempo; instead it starts slowly and ritualistically, taking advantage of mood and atmosphere. Once sated however, Hell is then unleashed and the band rip forth with scorching Satanic Black Metal. For a band who are so well established and have so many releases there is still a hunger at work here and it comes across in the songs. Some of the riffs and melodies they use are extremely tasty and designed to evoke feelings of almost tense uneasiness. Extra effects, horns, etc. further add to the mood and Enthroned show themselves to be on the top of their game. Just listen to the start of Lamp of Invisible Lights for example. I mean come on! Other bands just aren’t trying by comparison. The album is full of moments like these. The band have an evolved sense of dynamics and the songwriting on this release is very enjoyable. They appear to have developed an aura of corruption and awe-filled terror for this album. It reminds me of the recent masterpiece by Corpsessed, only filtered through a razor-sharp Black Metal lens. The band explore a variety of interesting ideas and songs structures within the confines of their chosen genre. This is not an album that sounds repetitive, and even features that rarest of things – the, (whisper it! ), Black Metal guitar solo. Enthroned appear to just be improving with age. This is a brilliant album and a must for all fans of Extreme Metal. I really can’t say enough good things about Sovereigns; this is exactly what I want from Black Metal in 2014. Hi! For people that are unfamiliar with Corpsessed, introduce yourself! Quite simply, Corpsessed is a five piece death metal band from Southern Finland. We started the band in 2007, and so far have released 2 EPs and our first full-length album “Abysmal Thresholds” that came out in early 2014. Give us a little background about the band. The history of Corpsessed is rather brief, though most of us have been playing in different bands for quite many years before this. Niko (vocals), Jussi-Pekka (drums) and Matti (guitars) met in 2006 while playing for fun in another band. We wanted to start something more serious and death metal oriented and asked Jyri (guitars) to join in, and so Corpsessed was born in the beginning of 2007. Mikko (bass) joined us in 2009. This is probably also the point when the bands sound and direction got more defined and we started to concentrate on recording our first output “The Dagger & The Chalice” EP, originally meant as a demo, which got us signed to Dark Descent Records. In 2012 we released our second “Untitled” seven inch EP and tightened the band by playing a load of gigs. The year 2013 was dedicated fully in creating our first full-length album “Abysmal Thresholds”, which is now released in the beginning of 2014. The influences are quite numerous ranging through death, black and doom metal. Mostly the stuff from early 90s, especially the Finnish death metal bands of that time. Movie soundtracks and dark ambient plays a somewhat significant role as well, mainly in the atmosphere part – the music is still pure death metal. Lot’s of stuff. Besides the old classics (that you always return to) some more current bands that we’ve been listening to at the moment include Tyrants Blood, Bölzer, Death Toll 80k, Nails, Anhedonist, Pseudogod, The Ruins of Beverast and Wodensthrone… and probably loads more, there’s 5 people in the band with a broad taste in music so the list could get long. The sound of Abysmal Thresholds is absolutely horrifying – what made you decide to concentrate on creating such an atmosphere? Thank you. It probably wasn’t a conscious decision in anyway to concentrate on certain kind of atmosphere. That’s just how the songs came naturally to us. Sure, we have preferences how we would like our own material to sound and we push it towards that direction, but it’s not really anything too planned out – the music just flows out that way, and we know what kind of riffs fit the concept of the band. The sound comes mostly from our love for atmospheres that evoke dread and horror and the low frequencies on guitar and bass, music that resonates your whole body and almost suffocates you. That’s how we sound live, and tried to capture that on the album. The songs bleed malevolence and ooze evil. How did you come up with the songs? Matti or Jyri usually write riffs on their own, sometimes even full song structures that they bring to the rehearsals. We then start working on them as a group making our own arrangements to the riffs and structures, adding details and playing around with the different moods and atmospheres. It all starts with the riffs and the drums usually set down the structure of the song. We know when the song is complete when it flows naturally (to us) and has a sense of wholeness to it.. Vocal arrangements come last. We always start with different kind of rhythm patterns for them that serve the riffs and then make the lyrics fit them. But in the end, creating the songs is not something you can pin point down to some details or patterns, you just feel it. What’s next for Corpsessed? What does 2014 hold? Well, we just completed the debut album which was actually quite an arduous experience so don’t expect a new album too soon. We don’t have any big plans yet. Let’s see how this album is received, do a few live gigs and slowly start composing new stuff at a natural pace when the ideas and inspiration flows for them. We’d probably like to do an EP or two before even thinking about a new full length album, as those are always huge projects that require a lot of time and work. And finally; with such a completely nightmare sound you’ve created here, the obvious question is: how are you going to top this? Is it even possible to take this to the next level of Hellish experience for your next album to create an even more terrifying vision? I mean, without causing your listeners heart attacks of course. There’s always room for improvement and aspirations for writing new (and hopefully better) songs, and taking things to a next level. Not perhaps in technicality, but trying to top yourself in song writing and capturing the atmosphere, trying out different recording methods. We’d like to for example experiment with recording something completely live to try and capture the live sound even more proficiently, as we feel that’s where the band is at their best. The future is always open and obscure. 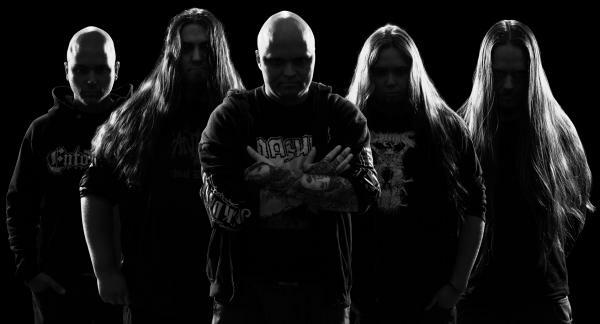 After a disconcerting intro, Finnish Death Metal band Corpsessed proceed to terrify the listener with their thick and impenetrable evil sound. Of Desolation starts things off and just oozes menace and class. Sounding like it has been transported to this plane of existence from some horrible Hell-dimension, the band proceed to channel 48 minutes of thoroughly upsetting music that uses sound as a warning of what’s lurking in the darkness. The band evoke strong feelings of dread and fear with their songs through skilful use of dark melodies and subtle additions of Black Metal touches to their sound. Indeed, although Abysmal Thresholds is thoroughly grounded in Death Metal there are detectable influences from the Black Metal camp that serve to enhance the innate sense of wrongness and ungodliness that these songs inspire. Corpsessed have mastered the art of atmosphere there’s no doubting that; these tracks bleed malevolence. The guitars create a foundation of unease from which the songs are moulded while the guttural vocals underscore everything and spread their darkened word. This is more than a mere album; this is like a message from some damned, horrible place. Each song is a new word and by the end of it you’ve lost your mind. I can’t get enough of this! This is Death Metal at its best – dark, scary, heavy, brilliant. This album sounds like the aural equivalent of Death itself.